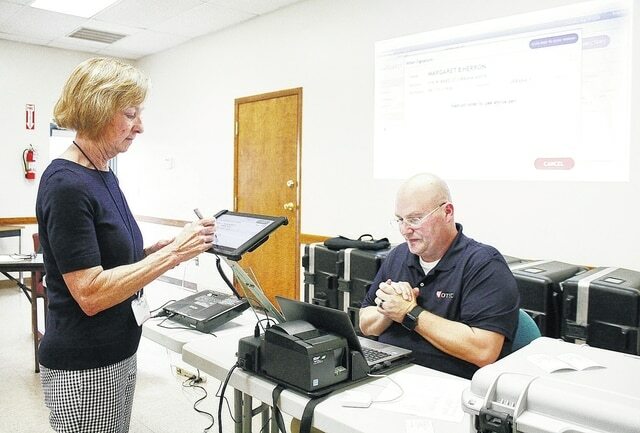 Shelby County Board of Elections Director Dawn Billing, left, of Sidney, signs her name on a VOTEC electronic poll book during a demonstration by VOTEC Elections Projects Manager Keir Holeman, of Beavercreek, at the Shelby County Board of Elections Thursday, Aug. 18. Two other companies KNOWINK and Election Systems and Software also demonstrated their electronic poll books for board of elections members and the Shelby County Commissioners. The Shelby County Board of Elections will decide which of the three companies Shelby County will start using in 2017. The three companies that demonstrated their products were the finalists chosen by the board from a longer list of considered companies. The electronic poll books will replace the roster books currently used to keep track of who is voting.